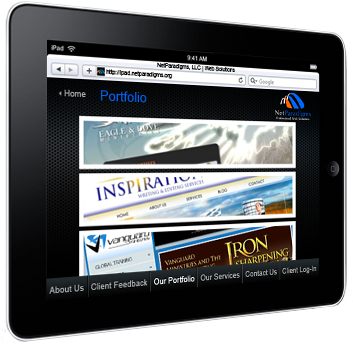 iPhone and iPad Website Design and Development by NetParadigms®, LLC. It's estimated that by 2013, more people will be connecting to the Internet using mobile devices than on desktop PC's. NetParadigms offers *iPhone® and iPad™ custom mobile web solutions so you can effectively communicate your vision using the latest custom mobile web technology and meet your users where they are. Our customized mobile web solutions help you capture mobile web traffic and direct users to a uniquely tailored mobile web environment. In addition to iPhone® and iPad™ mobile web customization, NetParadigms also offers custom web solutions for other mobile devices outside of the Apple/Mac family. 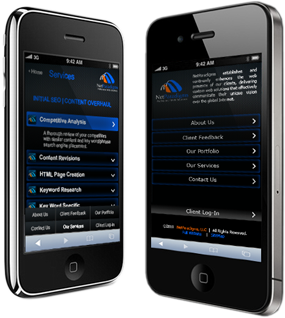 Contact us for more information on our complete mobile web solutions. *iPhone® and iPad™ are trademarks of Apple Inc., registered in the US and other countries.